On April 20th, 2010, the Deepwater Horizon oil spill began, ultimately spilling over three million barrels of crude oil into the Gulf of Mexico. There was significant vegetation loss in many tidal wetland ecosystems along the Gulf Coast where oil had washed ashore. This tragic event has prompted research to study how valuable habitats respond and recover after a major disturbance like an oil spill. Foundational species are the plants and animals that can engineer a habitat. For example, the salt marsh cordgrass Spartina alterniflora is a habitat, a food source, an oxygen producer, among other things. 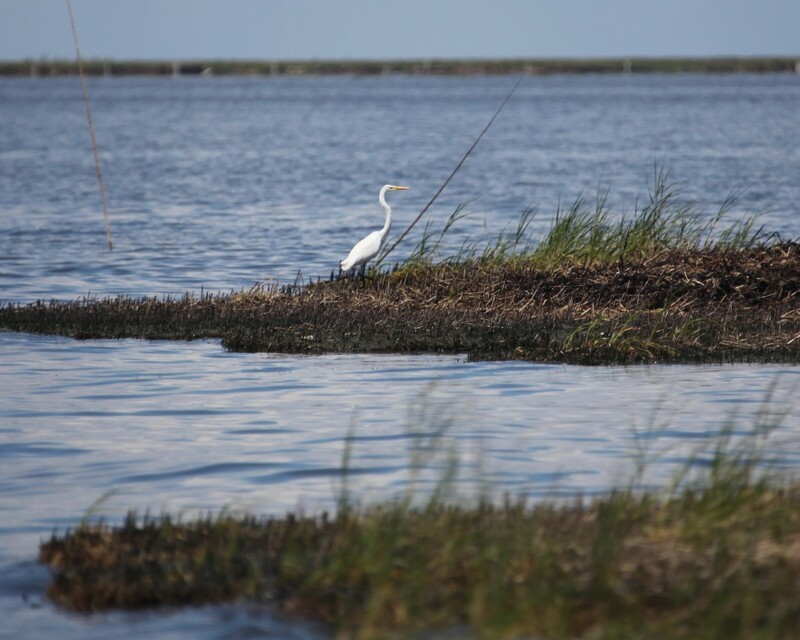 This foundational vegetation species can help define the salt marsh itself, as its health and presence can control food availability, influence water quality, and determine shelter. So, when an ecosystem is disturbed by an oil spill (or other disturbance), its recovery often goes hand-in-hand with the recovery of that foundational species. Resource subsidy is something added to an ecosystem that might help increase the ecosystem’s productivity and recovery. An example is fertilizer, which could help the foundational species to recover faster. However, whether or not fertilizer is an effective resource subsidy is not always clear. David Samuel Johnson and his colleagues set out to study this issue further. 4) both slow-release fertilizer added and the Spartina alterniflora planted. After two months and again after seven months, the researchers measured the mass of the aboveground vegetation, the concentration of benthic microalgae (aka chlorophyll concentration), and the number and type of invertebrates found within the sediment (called infauna). The abundance of the sediment infauna were then compared between the different test plot areas to assess whether the addition of fertilizer enhanced the early colonization of animals after an oil spill. In a nutshell, the addition of fertilizer had very little effect on the vegetation and benthic infauna. The marsh grass plantings, not the addition of fertilizer, was associated with the biggest differences. For example, after 2 months, there were significantly more benthic infauna present in the vegetated plots compared to the unvegetated plots, with no effects from the fertilizer additions. However, that trend disappeared after seven months. Only one organism, a worm, had significantly higher densities on the vegetated plots after both two and seven months. What does this mean for a salt marsh effected by an oil spill? The main take home from this study is that the re-establishment of a salt marsh’s foundational species, the salt marsh cordgrass, is among the most important ecological factors in a salt marsh’s recovery from an oil spill. The addition of a ‘resource subsidy,’ such as fertilizer, had no significant benefit in stimulating growth. The increase in benthic algae after two months was the only notable biological effect resulting from the fertilizer additions. However, the lack of associated increase in benthic infauna suggests that the marsh invertebrates are not dependent on benthic algae as a food source, so it did little to stimulate critter colonization. After two months, the plots planted with the foundational species Spartina alterniflora had more invertebrates; however, that difference disappeared after seven months. The researchers hypothesize that after seven months, salt marsh plants naturally started growing in the unvegetated plots. This would make the vegetated and unvegetated plots no longer that different. But the addition of marsh grass plantings allowed the colonization to happen much faster. Thus, planting and/or promoting the growth of foundational species, like salt marsh cordgrass, is likely a much better approach to help a salt marsh recover from an oil spill than adding fertilizer. The presence of marsh vegetation promotes invertebrate colonization – which is an early sign of the salt marsh’s recovery. I earned a Ph.D. in Oceanography from the University of Rhode Island Graduate School of Oceanography in 2014. My research focused on the sources and fluxes of black carbon in the Subtropical Atlantic. After, I was a postdoctoral scholar at the University of Maryland Center for Environmental Science studying extreme climate change. I am currently the Research Coordinator for the Delaware National Estuarine Research Reserve in the Delaware Department of Natural Resources and Environmental Control. O Christmas tree, O Christmas tree. How Christmas tree farms affect bird communities.